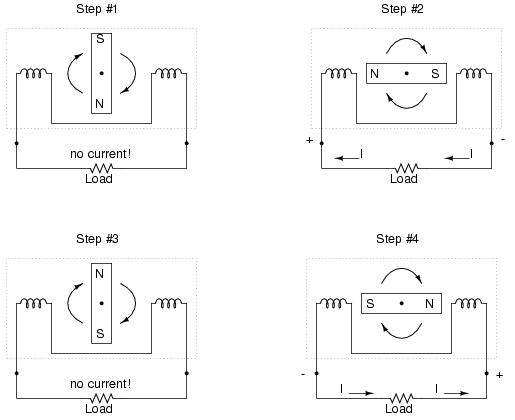 The transformer's ability to step AC voltage up or down with ease gives AC an advantage unmatched by DC in the realm of power distribution in figure below. 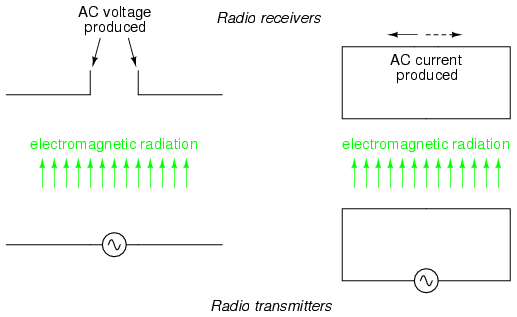 When transmitting electrical power over long distances, it is far more efficient to do so with stepped-up voltages and stepped-down currents (smaller-diameter wire with less resistive power losses), then step the voltage back down and the current back up for industry, business, or consumer use use. As you can see, one octave is equal to eight white keys' worth of distance on a piano keyboard. 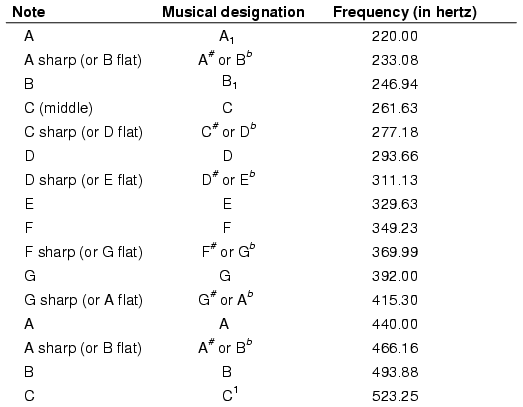 The familiar musical mnemonic (doe-ray-mee-fah-so-lah-tee-doe) -- yes, the same pattern immortalized in the whimsical Rodgers and Hammerstein song sung in The Sound of Music -- covers one octave from C to C.
In addition to RMS, average, peak (crest), and peak-to-peak measures of an AC waveform, there are ratios expressing the proportionality between some of these fundamental measurements. 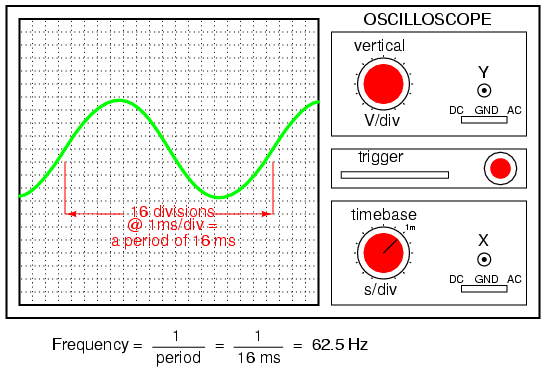 The crest factor of an AC waveform, for instance, is the ratio of its peak (crest) value divided by its RMS value. 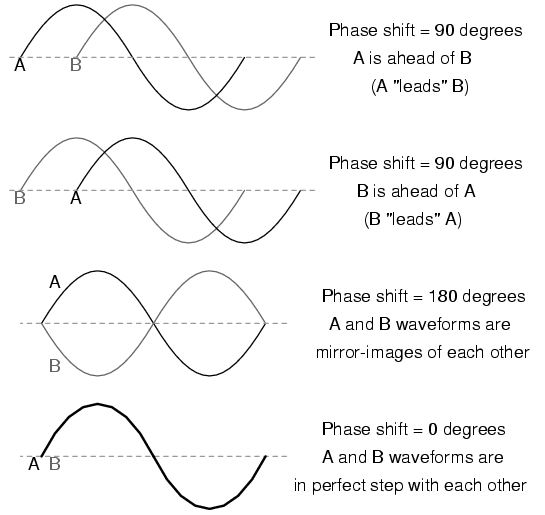 The form factor of an AC waveform is the ratio of its peak value divided by its average value. 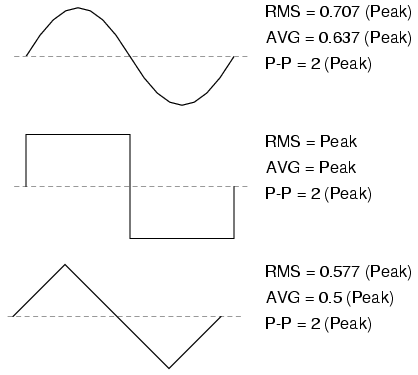 Square-shaped waveforms always have crest and form factors equal to 1, since the peak is the same as the RMS and average values. 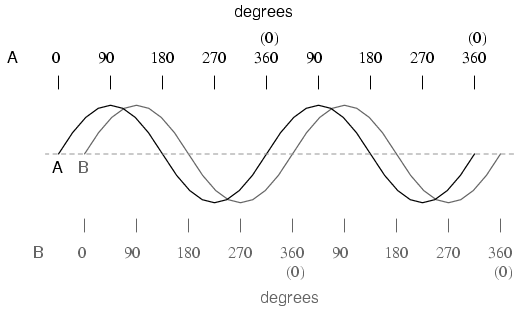 Sinusoidal waveforms have crest factors of 1.414 (the square root of 2) and form factors of 1.571 (π/2). 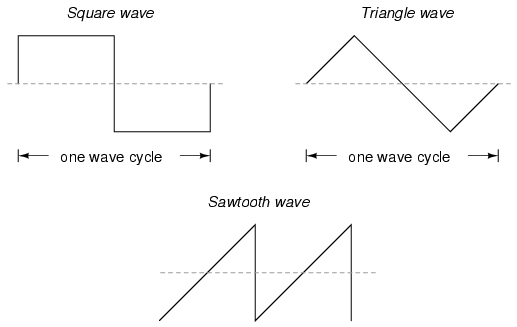 Triangle- and sawtooth-shaped waveforms have crest values of 1.732 (the square root of 3) and form factors of 2. 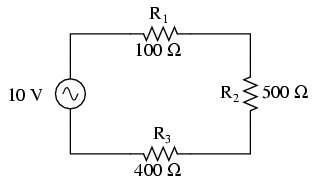 Since the sine-wave shape is most common in electrical measurements, it is the waveshape assumed for analog meter calibration, and the small multiple used in the calibration of the meter is 1.1107 (the form factor π/2 divided by the crest factor 1.414: the ratio of RMS divided by average for a sinusoidal waveform). 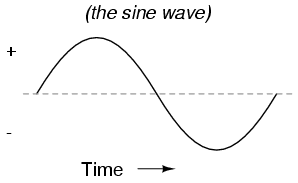 Any waveshape other than a pure sine wave will have a different ratio of RMS and average values, and thus a meter calibrated for sine-wave voltage or current will not indicate true RMS when reading a non-sinusoidal wave. 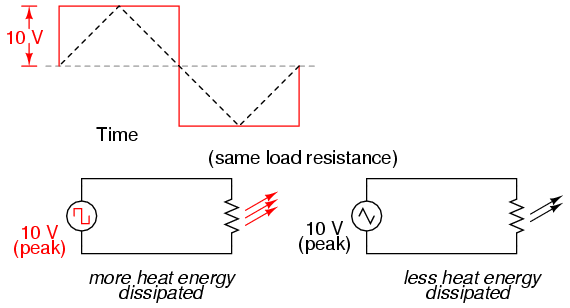 Bear in mind that this limitation applies only to simple, analog AC meters not employing “True-RMS” technology. 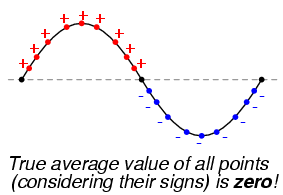 The form factor of an AC waveform is the ratio of its peak (crest) value to its average value. 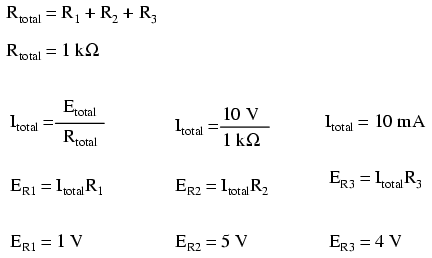 Series resistances still add, parallel resistances still diminish, and the Laws of Kirchhoff and Ohm still hold true. 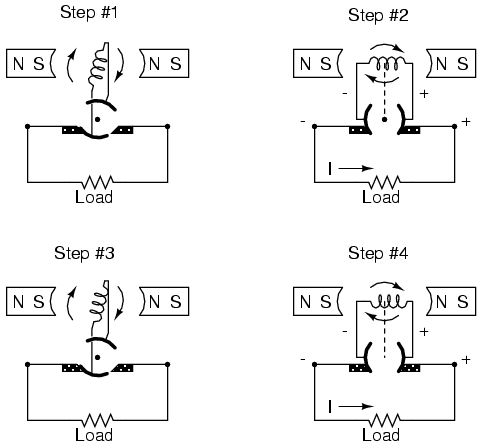 Actually, as we will discover later on, these rules and laws always hold true, it's just that we have to express the quantities of voltage, current, and opposition to current in more advanced mathematical forms. 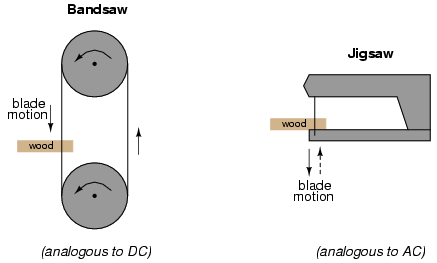 With purely resistive circuits, however, these complexities of AC are of no practical consequence, and so we can treat the numbers as though we were dealing with simple DC quantities.